The awards which were presented at a ceremony in the Crowne Plaza Hotel, Santry, Dublin on Thursday, 22 November 2018, in association with the Department of Housing, Planning and Local Government, aim to acknowledge and encourage best practice and constructive initiatives by local authorities. 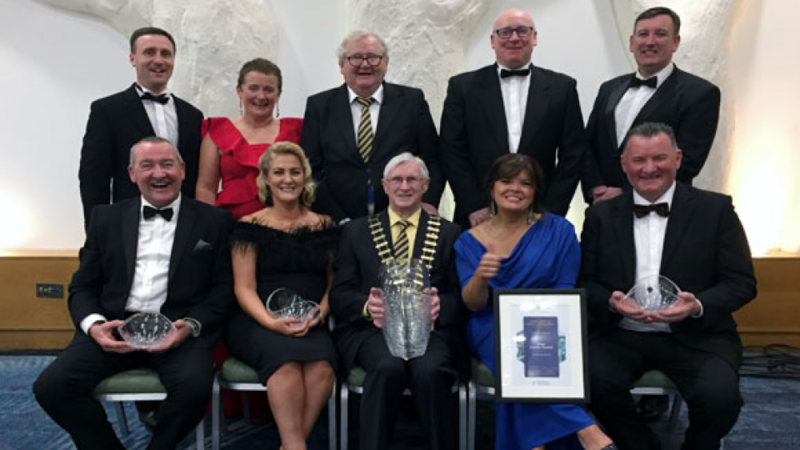 Clare County Council was also named overall winner in three award categories having been nominated for a record 11 out of 16 categories on the night. The winning Council initiatives were Friars Walk Coach Park Ennis (Outstanding initiative through the Municipal Districts), Community Mobilisation Unit: Rural & Community Development Officer (Best Practice in Citizen Engagement) and The Burren & Cliffs of Moher UNESCO Global Geopark (Sustainable Environment). Visit www.chambers.ie for more on the Chambers Ireland Excellence in Local Government Awards. Photograph: Clare County Council officials and Elected Members pictured at the Chambers Ireland Excellence in Local Government Awards in the Crowne Plaza Hotel, Santry, Dublin, where Clare County Council was named Local Authority of the Year 2018 (Front L-R): Pat Dowling, Chief Executive; Anne Haugh, Director of Social Development; Councillor Michael Begley, Mayor of Clare; Councillor Clare Colleran Molloy, Mayor of Ennis Municipal District; Councillor Pat Hayes; Leas Cathaoirleach of Killaloe Municipal District. (Back L-R) Leonard Cleary, Director of Rural Development; Carmel Kirby, Director of Physical Development; Councillor Pat McMahon, Leas Cathaoirleach of Shannon Municipal District; Liam Conneally; Director of Economic Development; Councillor Ian Lynch, Cathaoirleach of West Clare Municipal District.